Not to be confused with Parkinson's law of triviality. 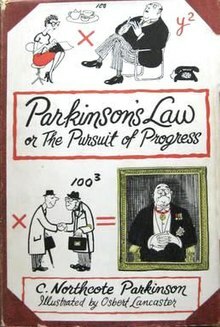 Parkinson's law is the adage that "work expands so as to fill the time available for its completion". It is sometimes applied to the growth of bureaucracy in an organization. Articulated by Cyril Northcote Parkinson as part of the first sentence of an essay published in The Economist in 1955 and since republished online, it was reprinted with other essays in the book Parkinson's Law: The Pursuit of Progress (London, John Murray, 1958). He derived the dictum from his extensive experience in the British Civil Service. A current form of the law is not the one Parkinson refers to by that name in the article, but a mathematical equation describing the rate at which bureaucracies expand over time. Much of the essay is dedicated to a summary of purportedly scientific observations supporting the law, such as the increase in the number of employees at the Colonial Office while the British Empire declined (he shows that it had its greatest number of staff when it was folded into the Foreign Office because of a lack of colonies to administer). He explains this growth by two forces: (1) "An official wants to multiply subordinates, not rivals" and (2) "Officials make work for each other." He notes that the number employed in a bureaucracy rose by 5–7% per year "irrespective of any variation in the amount of work (if any) to be done". Parkinson's Law was translated into many languages. It was highly popular in the Soviet Union and the Communist bloc. In 1986, Alessandro Natta complained about the swelling bureaucracy in Italy. Mikhail Gorbachev responded that "Parkinson's law works everywhere." If you wait until the last minute, it only takes a minute to do. Work contracts to fit in the time we give it. In ten hours a day you have time to fall twice as far behind your commitments as in five hours a day. Data expands to fill the space available for storage. The demand upon a resource tends to expand to match the supply of the resource (If the price is zero). This generalization has become very similar to the economic law of demand; the lower the price of a service or commodity, the greater the quantity demanded. This is also referred to as induced demand. The amount of time that one has to perform a task is the amount of time it will take to complete the task. Parkinson also proposed a rule about the efficiency of administrative councils. He defined a "coefficient of inefficiency" with the number of members as the main determining variable. This is a semi-humorous attempt to define the size at which a committee or other decision-making body becomes completely inefficient. The first cabinet was the Council of the Crown, now the House of Lords, which grew from an unknown number to 29, to 50 before 1600, by which time it had lost much of its power. A new body was appointed in 1257, the "Lords of the King's Council", numbering fewer than 10. The body grew, and ceased to meet when it had 172 members. The third incarnation was the Privy Council, initially also numbering fewer than 10 members, rising to 47 in 1679. In 1715, the Privy Council lost power to the Cabinet Council with eight members, rising to 20 by 1725. Around 1740, the Cabinet Council was superseded by an inner group, called the Cabinet, initially with five members. At the time of Parkinson's study (the 1950s), the Cabinet was still the official governing body. Parkinson observed that, from 1939 on, there was an effort to save the Cabinet as an institution. The membership had been fluctuating from a high of 23 members in 1939, down to 18 in 1954. A detailed mathematical expression is proposed by Parkinson for the coefficient of inefficiency, featuring many possible influences. In 2008, an attempt was made to empirically verify the proposed model. Parkinson's conjecture that membership exceeding a number "between 19.9 and 22.4" makes a committee manifestly inefficient seems well justified by the evidence proposed. Less certain is the optimal number of members, which must lie between three (a logical minimum) and 20. (Within a group of 20, individual discussions may occur, diluting the power of the leader.) That it may be eight seems arguable but is not supported by observation: no contemporary government in Parkinson's data set had eight members, and only the unfortunate king Charles I of England had a Committee of State of that size. Other chapters relate to what time to arrive at a cocktail party, how best to select applicants, what is the best age to retire, and "injelitance": the disastrous rise to authority of individuals with an unusually high combination of incompetence and jealousy expressed in the chemical formula I3J5. He also wrote the book Mrs. Parkinson's Law: and Other Studies in Domestic Science. ^ Parkinson, Cyril Northcote (19 November 1955). "Parkinson's Law". The Economist. London. ^ Fowler, Elizabeth M (5 May 1957). "It's a 'Law' now: Payrolls grow". The New York Times. ^ Brown, Archie (2009). The Rise and Fall of Communism. New York: Ecco. p. 589. ^ O'Sullivan, John (June 2008). "Margaret Thatcher: A Legacy of Freedom". Imprimis. Hillsdale College. 37 (6): 6. ^ Pannett, Alan Shalini Sequeira; Dines, Andrew; Day, Andrew (2013). Key Skills for Professionals: How to Succeed in Professional Services. Kogan Page. p. 65. ^ Barber, Cam. "How to write a speech in 15 minutes". Vivid method. Retrieved 11 November 2014. ^ Isaac Asimov, in Nightfall and Other Stories, introductory material to "The Machine That Won the War"
^ Jansen, Peter (2008). IT-Service-Management Volgens ITIL. Derde Editie. Pearson Education. p. 179. ISBN 978-90-430-1323-9. ^ A Brief List of Misused English Terms in EU Publications (PDF) (Report). 18 June 2013. Archived from the original (PDF) on 18 June 2013. ^ Klimek, Peter; Hanel, Rudolf; Thurner, Stefan (14 April 2008), "To how many politicians should government be left? ", Physica A, arXiv:0804.2202, Bibcode:2009PhyA..388.3939K, doi:10.1016/j.physa.2009.06.012, It is often argued – as now e.g. in the discussion of the future size of the European Commission – that decision making bodies of a size beyond 20 become strongly inefficient. We report empirical evidence that the performance of national governments declines with increasing membership and undergoes a qualitative change in behavior at a particular group size. We use recent UNDP, World Bank and CIA data on overall government efficacy, i.e. stability, the quality of policy formulation as well as human development indices of individual countries and relate it to the country's cabinet size. We are able to understand our findings through a simple physical model of opinion dynamics in groups. .
Grunwald, Beverly (17 November 1968). "Mrs. Parkinson's Law". The New York Times Book Review. p. 5. Parkinson, Cyril Northcote (19 November 1955), "Parkinson's Law", The Economist . ——— (November 1955), "Parkinson's Law" (PDF), The Economist, Berglas .